ER Home > Communications and Marketing Home > Feature Stories > 2018 > Modern, safe, inclusive and accessible student housing: College West housing re-opens! 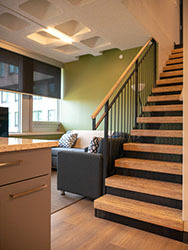 Modern, safe, inclusive and accessible student housing: College West housing re-opens! 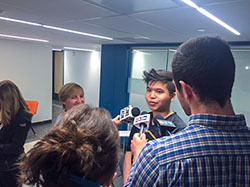 By Katherine Cormack Posted: August 21, 2018 6:00 p.m.
James Hsieh, fourth-year student, talks to media at grand re-opening event of College West housing. Fourth-year student James Hsieh LOVES his place in newly renovated College West housing. And so do his parents who remarked, “Wow! It’s better than a hotel,” when they had saw his new room and shared accommodation. James, who’s majoring in business with a minor in creative technologies, lived in College West housing prior to the two-year renovation and is excited to move back in to enjoy his great room, large kitchen, and updated bathroom that now has a bathtub, as well as a shower. “After a day of classes and studying, I can come home and just relax and not stress about things like utilities,” said the Calgary native. 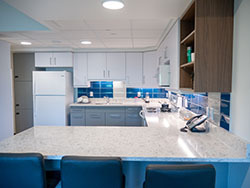 Located in the heart of the University of Regina main campus, College West housing has been home to thousands of students since it opened its doors in 1973. More than 40 years on in 2016, the building had reached the end of it life cycle. The decision was made to completely renovate 80,000 square feet of student housing - bringing it up to code and creating modern, safe, bright, airy, and accessible housing for 274 students. The U of R’s College West, Kīšik, Paskwāw and Wakpá towers are now able to accommodate 1,611 students in on-campus housing. 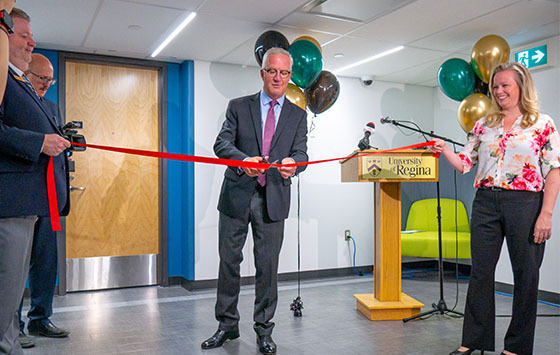 Student housing provides a much-needed service to University of Regina student learners and is a vital component of the recruitment process for international, national, and local students wishing to live on campus. As well, it provides much-needed conference facilities for the University and the community during the summer months. An array of common/communal spaces for students to promote interaction with neighbours and friends. Volunteers from the University community, including alumni, will be on hand to assist when students arrive on Move-in Day (August 31). The following week will be a busy one for students with Welcome Week activities including Orientation on September 4.